I had a request for this Sunday. 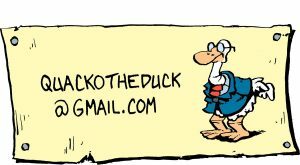 If there is a particular strip or story that you recall and would like to see again, please email me. Also I would like to thank all of you who emailed me with your best wishes for my dotage. Thank you all so much. The 2003-2004 collection should be available soon. I’ve had problems with the printer. But I think I have it taken care of. It’s really stupid. They say I can’t use my BoGrace signature on my covers. Try to explain to them. it’s like talking to a brick wall.